Over the past summer, European honey bees have been infrequent visitors to my little wildflower garden. I've been lamenting their decline and hoping for a return. But now that the wild autumn aster is in bloom, honey bees have suddenly appeared in droves. On a warm after the asters are swarming with literally hundreds of these bees, along with a good number of bumble bees and other native bees. Maybe an urban beekeeper has set up shop nearby? Who knows - but it is great to see them back! Since the autumn aster will be blooming well into October, I hope to have a few more photos of bees gathering nectar for the winter months. It’s a tradition, I guess. If one person alone can have a tradition. 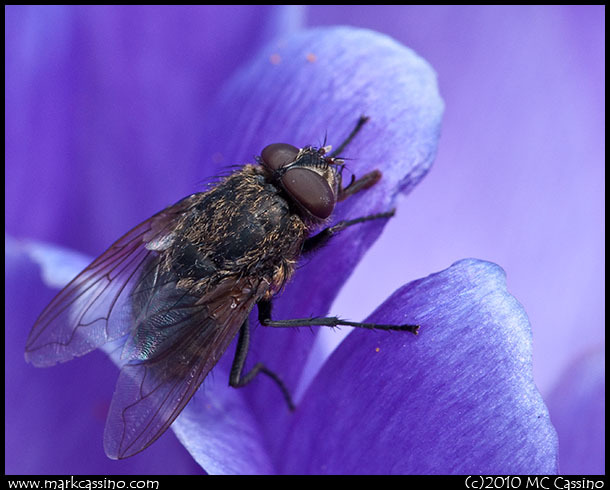 Each spring I try to get a photo of a honey bee in a crocus flower. Sometimes it works out… sometimes not. This spring presented me with a narrow window of opportunity. This spring is robust and early, and the crocuses bloomed all at once in mid March, in response to several days of mild weather. But as the flowers were out in their peak, a cold snap, heavy frost, and a bit of wet snow wiped them out. They came and they went all in a matter of days. Well, that officially kicks off the insect phtography season for another year… The dragonflies can’t be far off. Last spring a patch of weedy, straggly looking plants appeared in my garden. I was fairly confident that they were some sort of flower, so I let them go. The strip of dirt that I laughingly call my garden is really just a cultivated collection of wildflowers and weeds. In recent years it’s been the site of a more or less Darwinian competition. For a while the worst of the weeds - most notably spearmint and ragweed – held the upper hand. They choked out all but the most hardy cultivated perennials, and only the peonies were really able to hold their own. The Queen of the Prairie has always been able to struggle through the mint. And a few years ago some grey coneflower finally took hold, and is on its way to taking over. Combine that with the phlox, golden rod, and fall blooming clementis, and the garden has something blooming almost every week of the spring and summer. So – this patch of weedy green… By mid September I was about to give up on it. But as the month progressed I was pleased to see a few buds appear on the straggly stems. Then in early October I was happy to see the plants burst out in small white flowers. This patch of weeds that I had almost given up on turned out to be a dense clump of fall blooming aster. The small white keep on blooming, and here in mid October it is just now starting to fade. No one appreciates these last flowers of the year more than Honey Bees, Apis mellifera. On a warm October afternoon, the patch of Aster would be literally swarming with them. So for a couple of hours on a couple of afternoons, I sat in the grass and took a few snapshots of the bees working away at the flowers. 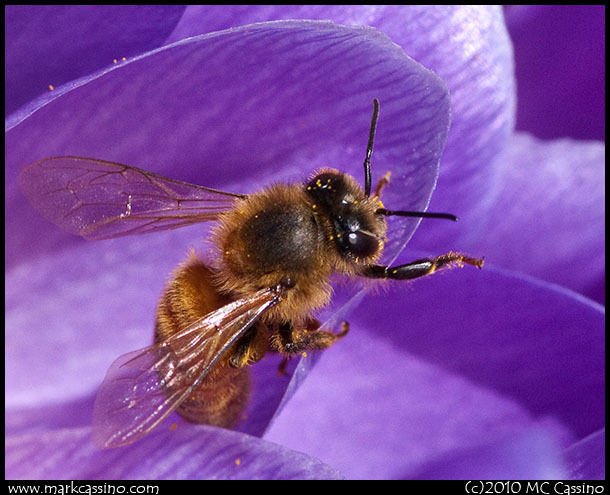 As I’ve said before - bees are among the first insects to emerge in early spring, and the last to disappear in the late fall. A couple shots are here, more in the image stream.